Today we’re pleased to open up pre-ordering for Love 2 Hate Politics, our first Love 2 Hate party card game expansion! When considering the current state of our politics, what can you do but laugh? 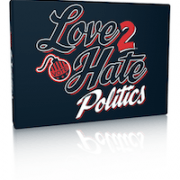 Love 2 Hate: Politics is here to help! This 108 card expansion adds a slew of new sentence Starter and Finisher cards to the game. Mix them in with your standard Love 2 Hate cards or play the expansion on its own for a themed experience. You may hate politics, but you’ll love this expansion!